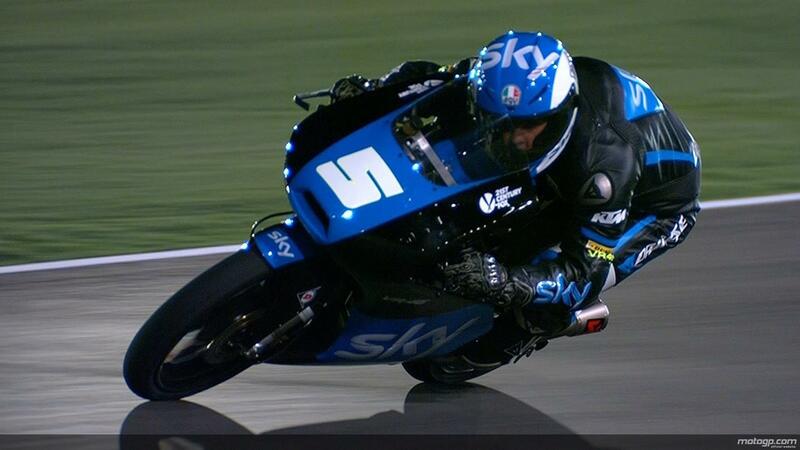 Romano Fenati has taken the Valentino Rossi Team Sky KTM to the top of the timesheets on day one of the 2014 season at Qatar, finishing 0.022 ahead of Jakub Kornfeil with a late lap only seconds of a second after the Czech set his own fastest lap of the day and right as the flag came down. Australian Jack Miller, tipped by many as the title favourite, was third, with Niccolò Antonelli fourth and Aleix Masbou the first of the Hondas in fifth. It was a good day for Scotsman John McPhee, as he finished eighth on his RTG Honda, three places ahead of Red Bull Husqvarna in eleventh, only a second off the provisional pole of Fenati.